The framing of the Ferrari house looks different in many ways. First off most people notice the engineered studs that were used to build the walls, but the placement of the studs are also quite different from what is typically seen around here. The exterior walls of the home are a blend of advanced framing and staggered stud framing techniques. Advanced framing has been around for quite a while, and was originally developed as a Value Engineered frame design. The value was found in the reduction in the amount of material necessary to frame a home, less labor, and an increase in the insulating value of the walls by reducing the number of voids in the insulation. The basics of Advanced framing are all the framing members must be on 2' centers and lined up with each other. For example the truss (or rafter), lands on top of the wall plate directly over the stud, which lands on top of the floor joist. This eliminates the need for a double top plate, since the roof load is transferred directly down on top of the framing members below. Headers are only used at locations that are carrying loads. Two stud corners (aka California corners) are used in place of triple studs at outside corners, and drywall clips are used to support the interior corners of the drywall. Ladder blocking is used where interior walls meet the exterior walls, instead of creating a 3 stud channel that is difficult to insulate. This framing approach requires a more careful layout of the framing to ensure that all load carrying framing members line up with the framing member below it. The staggered stud framing strategy was employed into the design of the house by the Architect. For the exterior walls we have 2x8 top and bottom plates with 2x4 studs staggered every 1' from one side of the plate to the other. The result is the exterior side of the wall has studs every 2' and the interior side of the wall has studs every 2'. This framing technique is typically used create a "quiet wall" that minimizes noise transfer from one side to the other since the studs don't touch both the interior and exterior wall surfaces, however, it does have other benefits. Staggering the studs creates a thermal break from the exterior side of the wall to the interior so that as the studs on the exterior side warm up in the sun, the heat isn't transferred to the interior side of the wall since they don't touch the drywall. It has also lent some flexibility in creating recesses in the walls at areas where traditionally a recess wouldn't have been possible. The staggered stud framing has probably cut down on the number of board feet of material required to frame the house as well. The 2x8 wall plates measure exactly 7 1/4" wide, and each stud measures 3 1/2" wide. Two studs together measure 7" in width leaving us a 1/4" shy of the wall plate width, so every 2' of exterior wall we are saving 1/4" x 8'10"(length of stud). I was not fully sold on the staggered stud framing approach prior to the start of framing. My feeling was that it would add quite a bit of labor to the project, and wasn't necessary since wood isn't a good conductor of heat. Now, after using this method in the field, I can see why the architect chose it, and would definitely do it again should the opportunity arise. I appreciate this report and wondering how the house turned out for energy efficiency? What did you use for insulation? Did you fill the cavity? I would like to use staggered stud on a house we hope to build in a small mountain town in southern Montana. I have done my site best to design an energy efficient house but now talking with local builders they all say that 2×6 construction is the way to go and staggered stud is not worth the extra expense for materials and cost for time to build. Do you know the pay back comparing the two? I know what the experts say but it is hard to stay convinced to fork out extra costs when there little support. Great questions! The house is not performing quite as well as we hoped on its electricity usage, although I suspect that lighting is the major draw. The client says the HVAC system rarely kicks on, so I would say our building envelope is performing quite well. The exterior wall cavities are filled the full depth with open cell foam insulation. The R-value of the open cell foam is approximately the same as fiberglass insulation of the same thickness, however you get better coverage with little to no voids using spray foam. You can dramatically increase the R-value by switching to closed cell foam insulation, although its nearly 3 times the cost (or was when we built this house) of open cell foam. I would go with 2×8 (minimum) wall plates should you choose to go with staggered stud framing. 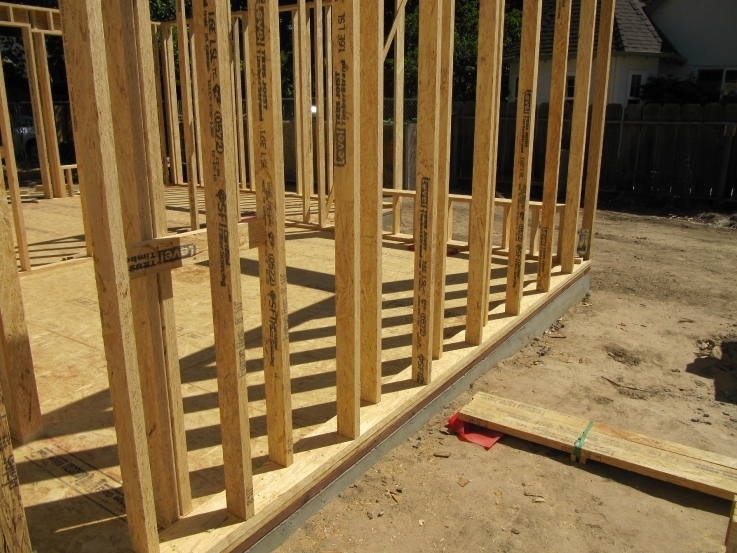 Your stud size will still be 2×4, but the larger plates allow for more depth of insulation to be installed and doesn’t add that much more in material costs for framing. The staggered stud frame also allows for overlapping in the seams of batt insulation, whereas the standard wall frame has potential heat transfer at the batt edges against studs and in any area (i.e. plumbing vents, electrical wiring, intersecting wall channels, etc.) where proper install becomes difficult. Taking cost considerations into account, I would recommend going with one of two options. Do a standard wall frame and spend the extra money for spray foam insulation, or do the staggered stud frame with 2×8 top & bottom plates and install batt insulation(cellulose batts are great!). I would love to hear what you choose, and see the progress of the build. Good luck! I can’t help but notice the lack of fire blocking on the exterior walls. How is this possible? Fire blocking is no longer required by code…at least in this area. Fire stops are required to block fire from getting into an attic, but not to break up a wall cavity. However, I still like to block both the interior and exterior walls when framing with standard green lumber. Blocking helps to keep the studs from twisting and keeps walls straight. This does mean using more lumber than is necessary to build a home, and would negate the point since this was a ‘green’ build. We used engineered lumber in order to achieve straight walls without using an unnessecary amount of lumber.